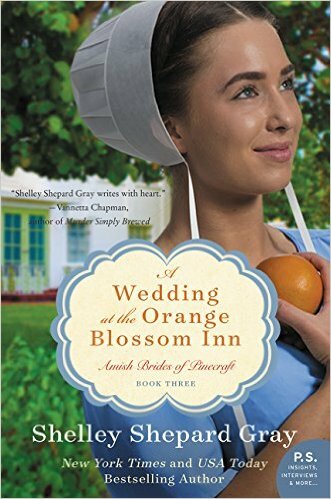 Shelley Shepard Gray returns with the third book in her Amish Brides of Pinecraft series—a story of second chances for two young single parents...and the wedding that brings them together. Emma Keim was heartbroken when her husband Sanford passed away, leaving her to raise three young daughters alone. In the years since, her relatives have made it no secret that they expect Emma to remain a widow, mourning Sanford indefinitely. But when she meets Jay Hilty—a widower with three young sons of his own—Emma is delighted to have a new friend who understands her struggles. And it doesn’t hurt that he’s also handsome and kind. Still, Emma is dismayed that her family is so opposed to their friendship—and the idea of it ever becoming anything more. She honors her husband’s memory every day, but is she destined to be alone forever? Jay knows that few people his age understand what it’s like to lose a spouse, and Emma’s gentleness with his boys stirs something in his heart that’s been quiet for far too long. But when Jay’s oldest son becomes engaged to a local woman, suddenly Jay, Emma, and their children are swept up in wedding preparations. Witnessing his son’s joy, Jay wonders if it’s time for him to move forward, too, and find happiness again. Jay wants to court Emma in earnest, but Emma’s relatives remain troubled by the prospect of her moving on. Once again, love has come to Pinecraft. But can these two parties of four become a happy, healthy family of eight? I have read several books by Shelley Shepard Gray in the past & I have loved them all.The newest book is "Wedding At Orange Blossom Inn" and is book 3 in the Pinecraft Brides series. This book just might be my all time favorite so far. A Wedding at the Orange Blossom Inn is a fun & charming addition to the series. Like with the other two books in this series, I sat down to read it in one sitting(when I should have been studying)! I was a little sad that this book ended so quickly, and I cannot wait until more books come out!